I've been on a non-fiction kick lately so things have been pretty quiet around here. Two stand out books I just finished are The Spark: A Mother's Story of Nurturing Genius and Bob Harper's The Skinny Rules. The Spark was excellent. I will be thinking about that book... forever probably. I'm currently reading Rump: The True Story of Rumpelstiltskin which is so cute so far. I'm also reading I Travel by Night by Robert McCammon because it arrived in the mail, and I couldn't resist starting it. It was released super early so hooray for pre-ordering and getting an awesome early surprise! I hope everyone has a really great week with warm weather and lots of reading! Be sure to let me know what you are reading this week (or leave me a link!). I wanted to read Ordinary Grace for the atmosphere promised by the book description. Coming of age stories are my absolute favorite, and the vision of growing up in the early 60s with baseball and root beer and family secrets made me really want to read Ordinary Grace. I'm happy to say Ordinary Grace delivered much of what I was hoping for. 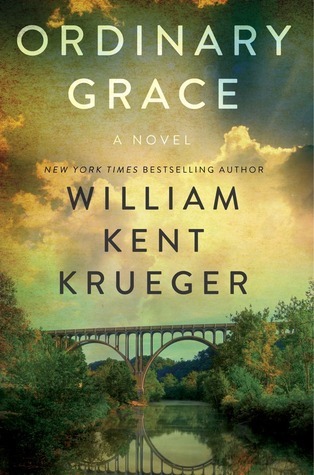 In the opening of Ordinary Grace, it was revealed that a young boy had been killed on the railroad tracks outside of town. This immediately called forth Stephen King's The Body (the story on which Stand by Me was based). For me that set a wonderful tone for the rest of Ordinary Grace which follows Frank and his brother Jake through a summer in New Bremen, Minnesota in 1961. I loved both Frank and Jake as well as most of the people closest to them. The one exception would be their mother. At first, I loved her honesty and her individuality, but I eventually grew to hate her. The more I hated her, though, the more I grew to love their father. If you prefer there be no religion in your fiction, this is not the book for you. Frank and Jake's father is a preacher and religion is interwoven throughout Ordinary Grace. 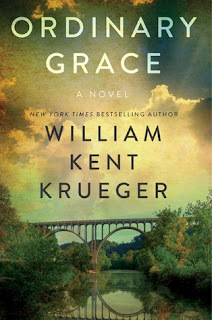 I thought the religious aspect was handled very well and there were several moving spiritual moments in Ordinary Grace. All in all, I enjoyed reading Ordinary Grace. Along with the wonderment that is inherent in a coming of age story, Ordinary Grace is about loss and tragedy and how a family holds itself together. It was a refreshingly well rounded story. It's been a long time since I've read something that felt as developed as Ordinary Grace. If you enjoy contemporary mysteries and coming of age stories, Ordinary Grace might be a great pick for you. The mystery wasn't shocking, but the journey through the summer of 1961 was a good one. I'm embarrassed to admit how much Neil Gaiman I have not yet read. So I won't. 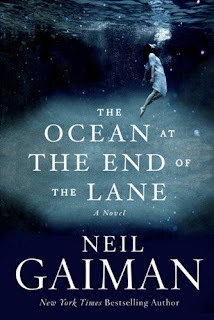 But I will admit to being very excited about his upcoming release: The Ocean at the End of the Lane. Dark creatures, other worlds, mysterious and possibly magical women... I'm so there. I'm dying to know all about the ocean that is in her duckpond. Are you a Neil Gaiman fan? Is The Ocean at the End of the Lane on your wishlist? What are you anxiously awaiting this week? Be sure to let me know in the comments or leave me a link! The Girl Who Circumnavigated Fairyland in a Ship of Her Own Making is the first book in Catherynne M. Valente's Fairyland series. I just went six months without a single 5-star read and then suddenly I read two in a row! 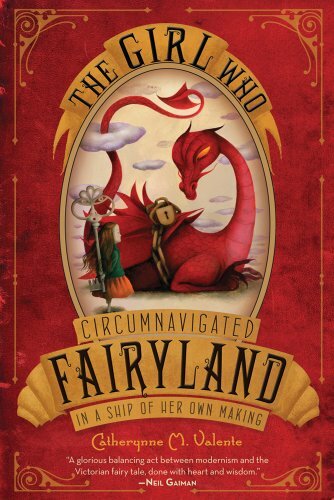 The Girl Who Circumnavigated Fairyland was a beautiful read. The writing was so brilliant and so imaginative. I absolutely loved it. One ought not to judge her: all children are Heartless. They have not grown a heart yet, which is why they can climb high trees and say shocking things and leap so very high grown-up hearts flutter in terror. Hearts weigh quite a lot. That is why it takes so long to grow one. But, as in their reading and arithmetic and drawing, different children proceed at different speeds. (It is well known that reading quickens the growth of a heart like nothing else.) Some small ones are terrible and fey, Utterly Heartless. Some are dear and sweet and Hardly Heartless At All. September stood very generally in the middle on the day the Green Wind took her, Somewhat Heartless, and Somewhat Grown. There is a place, September, oh, very far from Pandemonium. A place where it is always autumn, where there is always cider and pumpkin pie, where leaves are always orange and fresh-cut wood is always burning and it is always, just always Halloween. That's one of the best feelings in the world right there, and The Girl Who Circumnavigated Fairyland was simply a joy to read. There was a whole host of imaginative characters in The Girl Who Circumnavigated Fairyland, and I loved every single one of them. Even the evil Marquess. September was an awesome little girl to follow on an adventure. I totally fell in love with her, and I cannot wait to start another adventure with her in the second book. I have to say, the ending to The Girl Who Circumnavigated Fairyland is exactly how I wish all books in a series would end. There was enough closure to feel like I was given the entire story, but also a spark of excitement for what's to come. The Girl Who Circumnavigated Fairyland in a Ship of Her Own Making is an imaginative coming-of-age fairy tale that I highly recommend to anyone who is young at heart. It is one I am certain to revisit again and again.